O'Neill's erratic behavior and theft of Tollan technology results in his forced early retirement from the SGC. Soon afterward, Colonel Maybourne appears, offering him a position with his special NID unit. O'Neill agrees, and is introduced to an entire rogue operation, operating beyond the SGC, which steals alien technology for Earth defense. But O'Neill's involvement is part of a secret and elaborate plan, at the request of the Tollans and the Asgard, to terminate the rogue operation and restore diplomatic ties. Colonel Makepeace is among the agents who are apprehended, but Colonel Maybourne manages to avoid capture. The Asgard and the Tollan approached the SGC with evidence of theft of technology by the SGC. They, and the Nox, threatened to sever diplomatic ties. 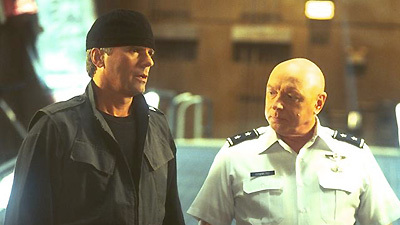 The Tollans insisted that the SGC apprehend their own rogue team, and the Asgard insisted that O'Neill be the only one involved. Maybourne led the rogue SG organization, described as an "offshoot" of the NID, with command coming from very high civilian levels. Their mission statement is to use whatever means necessary to acquire goods and technology that could help Earth in the battle against the Goa'uld, or other unforeseen aggressors. PX3-595 is an Asgard protected planet. The natives, known as Tiernods, are primitive, and hide from predators in caves, using an Asgard device to vanish. The mission to PX3-595 was to steal the Asgard vanishing device for the rogue organization. O'Neill gave the (unconfirmed) story that a secondary SGC base was to be established offworld as a backup, with O'Neill in command, but the Pentagon didn't grant the backing. Jack O'Neill plays chess, listens to opera, and reads Mad magazine.